A powerful earthquake on the Indonesian tourist island of Lombok killed at least 10 people, injured dozens and damaged hundreds of homes on Sunday, officials said. The shallow 6.4-magnitude quake, which jolted the island in the early morning, sent people running outside in panic and triggered landslides on popular mountain hiking routes. The initial tremor in the north of the island was followed by two strong secondary quakes and more than 100 aftershocks. 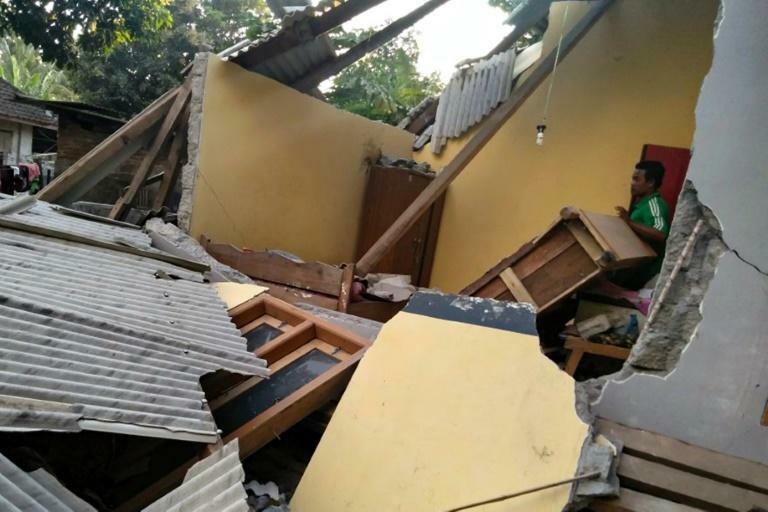 "The earthquake killed at least 10 people, some 40 people are injured and hundreds of houses were damaged," said Sutopo Purwo Nugroho, spokesman for Indonesia's disaster mitigation agency. "We estimate the number will keep rising because we are not done collecting data," Nugroho said. A 30-year old Malaysian woman was among the dead, he said, adding those hurt were hit by debris. As authorities scrambled to assess the damage to buildings and infrastructure, popular trekking trails on Mount Rinjani were closed because of landslides, according to the disaster agency. One local trek organiser described how rocks rained down on two Spanish hikers and their guide as they were caught on a mountain trail. "My trekking guide who was accompanying two tourists from Spain suffered from minor injuries during the jolt. They were hiking from Segara Anak Lake to Plawangan and rocks were falling on them during the quake," said Karyadi, the owner of a guesthouse near Rinjani where the pair were staying. "Our guests were in shock because of the incident," said Karyadi, who like many Indonesians goes by one name. "There have been almost non-stop tremors since this morning," he said. The epicentre of the earthquake struck 50 km (30 miles) northeast of Lombok's main city Mataram, the United States Geological Survey said, far from the main tourist spots on the south and west of the island. USGS said two of the aftershocks measured more than 5-magnitude. The jolt was felt some 100 km (60 miles) away in the bustling holiday island of Bali, although there were no immediate reports of damage there. "The earthquake was very strong... and everybody in my house panicked, we all ran outside," said Zulkifli, a resident of North Lombok, close to the epicentre. "All my neighbours also ran outside and the electricity was suddenly cut off," Zulkifli told AFP. No tsunami alert was issued, according to Indonesia's geophysics and meteorology agency. 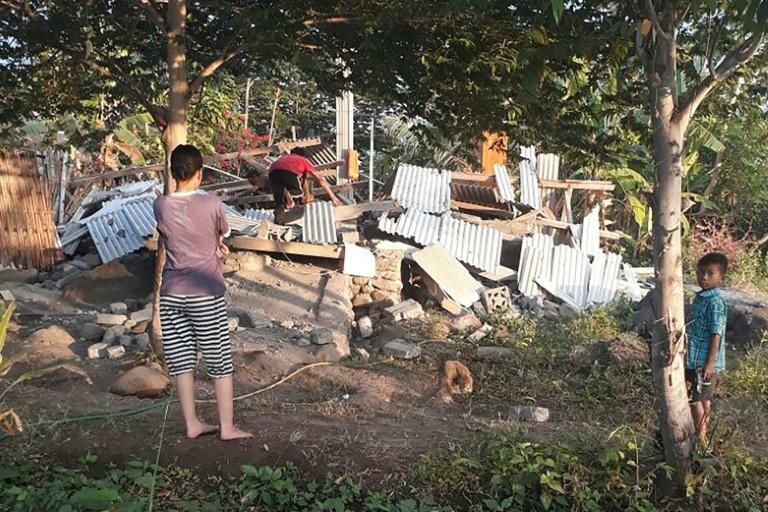 "People in East Lombok and Mataram felt the strong quake for 10 seconds, residents were panicking and running outside of their homes," Nugroho said earlier, adding people had run for open spaces like football fields. At the holiday island's hotels, tourists raced outside as the quake struck. At the Katamaran Hotel & Resort in Senggigi beach, some 30 guests gathered in the lobby for around half an hour before venturing back to their rooms. "They calmed down and returned to their rooms once we explained the earthquake did not trigger a tsunami. Everything is back to normal now," receptionist Ni Nyoman Suwarningsih told AFP. The quake also rocked the tiny Gili islands off northeast Lombok, which are popular with honeymooners. "Fortunately there was no panic during the earthquake even though it was quite strong," said Lilis Letisha, receptionist at the Ombak Paradise Hotel on Gili Air island. Indonesia, an archipelago of thousands of islands, sits on the so-called Pacific Ring of Fire, a seismic activity hotspot. It is frequently hit by quakes, most of them harmless. However, the region remains acutely alert to tremors that might trigger tsunamis.